Advent is the time during which the Church prepares for the coming of Jesus Christ, that is, for His birth as well as for His second coming. It begins with the Sunday nearest the feast of St. Andrew (November 30), and includes four Sundays, but not always four complete weeks. These four weeks are symbolical of the four thousand years during which man awaited the coming of the Messiah. The spirit animating the Church during the season of Advent is of penance and of holy longing. 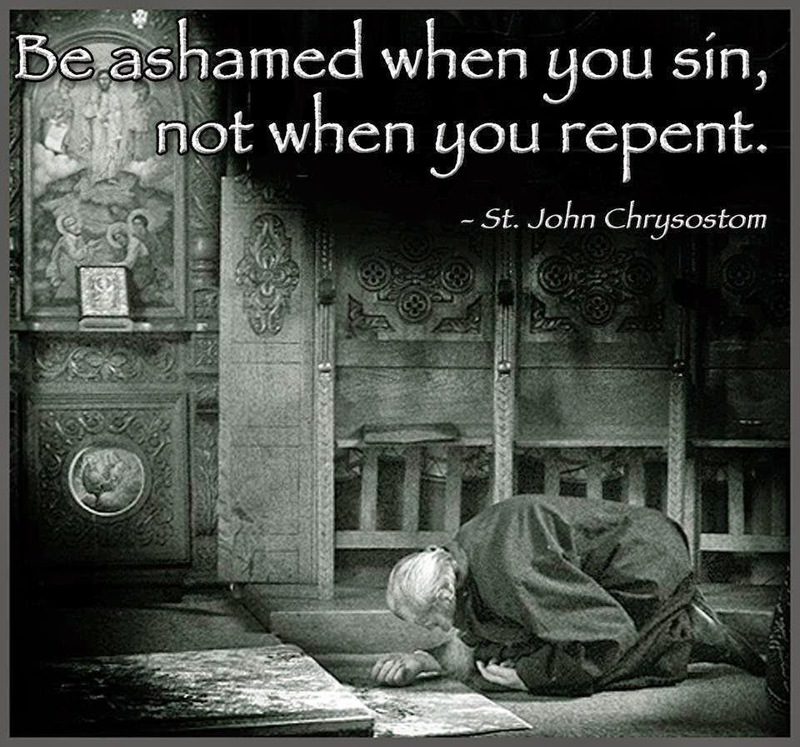 Of penance, to prepare the way of the Lord in the souls of the faithful. Of holy longing, to obtain for them the grace of receiving Him worthily. During Advent, except on feasts, violet vestments are used. The Te Deum is omitted from the Office of Matins and the Gloria from the Mass. No flowers are placed on the altar, and the organ is not played, except on feast days, on the third Sunday of Advent, on the Vigil of Christmas, etc. The solemnizing of marriage during this season is avoided. We wait for Him. Proprium de Tempore (Masses of the Liturgical Year). The first word of the liturgical year, which we heard today: "Ad" (to/towards). An act of motion. In the direction of God. The first sentence of the liturgical year: "To Thee I have lifted up my soul; my God, in Thee is my confidence." And yes to real Christmas cards. Only buy the cards our grandparents purchased. The war waged against Christianity is more intense than ever. The cards frequently no longer even say "Merry Christmas." Often, you will be lucky to find one with even the 3 magi on the cover. When at your North American mall, be selective of where you shop. I say boycott Hallmark stores for their clear as day absence of real Christmas cards. Carlton Cards stores I find to be better. Costco is another blatant one in their attack on the identity of Christmas. Jesus is the reason for the season. Keep Christ in Christmas. In an effort to make the most of what was left of ancient Rome's rubble - available construction materials found here and there, while still satisfying the traditional local and Byzantine rules of design, the Cosmati fractionized the basic motifs of their patterns through a mechanism of subdivisions that involved breaking a figure into small pieces by inscribing its inverse within in. The Cosmati were Roman artists who worked in and near Rome during the second half of the Middle Ages. The essence of Cosmatesque art lies in its ornament, specifically in a particular type of flat polychrome geometric ornament. Cosmatesque designs are rich with meaning and hidden symbolism. My personal favorite is the Quincunx (a double-cross motif). This you might say is the underlying geometry of the Quincunx-in-square. It is the highlight of ornaments in the Cosmatesque designs. An arrangement of fine things in a square or rectangle with one at each corner and one in the middle. The cross of St. Andrew. The same "X" traced on the floor during the consecration of a new church. The psalm Judica me is a psalm of repentance and hope,the psalm of the human element, the cries of the human condition, marred by sin and reborn with hope in the coming of the Messiah. The royal prophet, King David, in the anguish of his exile was long ago inspired to write this hallowed prayer. David, too, was born in Bethlehem. It expresses the sentiments of fear, but also those of confidence and desire, with which the priest should be animated when he stands at the foot of the altar. The anthem which precedes the psalm and which is taken from the psalm itself, indicates the dominant sentiments, one of confidence: "I will go unto the altar of God, to God who giveth joy to my youth." The same anthem we hope to sing as we enter our way into the heavenly reward. This psalm is not recited in Masses for the dead nor in Passiontide. The reason is found in the verse: "Why art thou sorrowful, O my soul?" since under such circumstances the soul ought to be sorrowful. 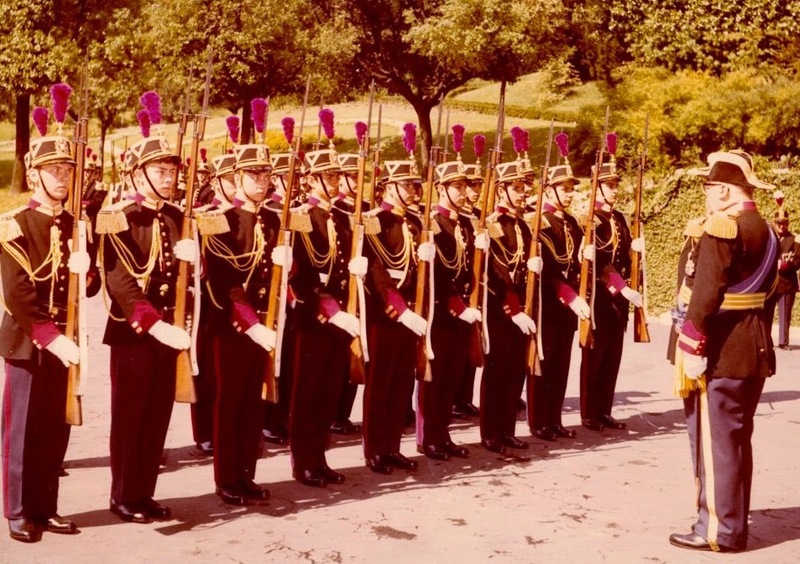 The old colour films are of great historical interest. The Americans were the first to film Rome from the air in color footage. In the area around the Vatican you see how the post-war urban development has changed the landscape. 1. The FALDA: a demi-soutane of white silk with a train which is borne by dignitaries of the papal court. 2. The MANTLE: for the papal chapels (analogous to the cope), which is white or red according to the feast or the office. It is ornamented with the formal or pectoral, a large plate of silver gilt, which serves to hold the edges of the mantle together over the breast of the Pontiff. 3. The FANON: which consists of two light mozettas. The upper one is worn outside the chasuble and the lower one over the alb. 4. The SUCCINCTORIUM: a vestment similar in shape to a maniple and, on solemn occasions, worn hanging from the cincture. 5. The TIARA: formed of three crowns placed one above the other, and enriched with diamonds and precious stones. It represents the pope's triple power of bishop, sovereign pontiff, and king. Exposition of Christian Doctrine by A Seminary Professor, p. 646. Instituted in 1903 by Leo XIII. An oldie, but a goodie...always a joy to hear his wit and wisdom. Blisters and skin chafing are common. So is dehydration. Drink a lot of water. Sometimes it hits day three or even before. These items can be purchased at a Farmacia. Tell your guide you need to make a stop there. It is the pharmacy, with green signage, and they can lead you to one. There is one located just across the street from the Vatican, on the south side. Moleskin helps for blisters. Attach the sticky part to the wound. Labocaina helps for chafed skin. It is a medicated ointment. Shower and apply before bedtime and even in the morning if necessary. Would be nice to see this replaced with a statue of Alcide de Gasperi. Located inside the historic Della Rovere Palace, just across from the Vatican. Developed in the late 1800s and named after the son-in-law of Queen Victoria, this lace gets its distinctive look by combining both machine-woven tapes with hand stitching. This lace immediately became popular and helped to revive the English lace-making industry and remains a popular embellishment for the linen rochet or cotta. The rapid growth of the modern liturgical movement led to a whole plethora of small daily missals being published in the U.S.A. around the time of the 1950s. Such a fine job was done. I always prefer these older editions - they feel like a missal and even smell like a missal. "While the separate nationalities all inherit parts of the European tradition, we as Catholics inherit the whole. It was our predecessors who founded and built up the European unity. We are the heirs of Constantine and St. Leo, of St. Benedict and St. Gregory, of Boniface and Charlemagne, of Alfred and St. Stephen of Hungary and St. Louis of France. There is nothing in the European past that has not been formed or modified by Catholic influences, and even the heresiarchs and revolutionaries have come from us and been inspired by an exaggerated or partial devotion to some element in the common tradition. Thus Catholics have an historical mission to maintain and strengthen the unity of Western civilization against the destructive forces that are attempting its total subversion." At the request of the family, it was a Low Mass. Cathedral of St. Matthew, just a short walk from the White House. Cardinal Cushing of Boston in his red buckled shoes. 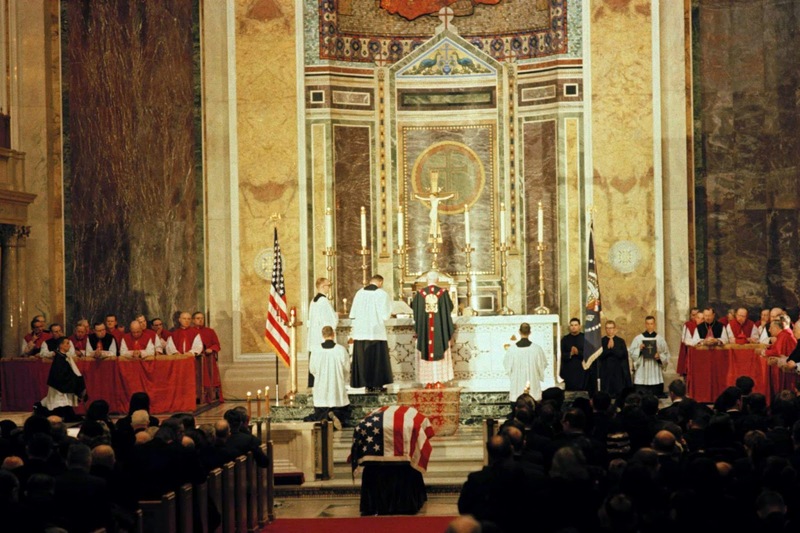 The U.S. bishops were in Rome for the Vatican Council and they held their own Solemn Requiem Mass for the President at the Lateran Archbasilica with Cardinal Spellman. Thanks for the pic, Summer! Santa Maria della Scala in Trastevere. When the Servant of God passed away in 2002, his mortal remains were laid to rest in the Vatican vault at Rome's main cemetery, the Campo Verano. Ten years later, his remains were removed to this altar, inside this favorite Rome church, his former titular church as Cardinal Deacon. 13 years in solitary confinement, his story is a precious witness. The Cardinal once came to my university for a visit to deliver a lecture. He came at the invitation of the distinguished Center for Catholic Studies at the University of St. Thomas. We were all deeply moved by both his lecture as well a small meeting held in a student commons. During his lecture, the Cardinal explained that his jailers had asked him to teach them Latin and so he did. Looking up at the audience, he said with a broad smile: "You think communists don't speak Latin?!" On this day, November 24, we remember as a memorial one hundred seventeen martyrs of Vietnam who lost their lives in various persecutions from 1740-1883. This group of ninety-six native Vietnamese and twenty-one Spanish and French missionaries suffered brutal tortures for the Faith. Sadly, there are just a handful left. A fine bunch, but there are so very few Italian vocations. I even heard the Dominicans recently had to close their fabled convent in Naples, where Thomas Aquinas had lived. There are just no Italian Dominicans left and they have next to no ordinations in the Italian provinces. A titanic loss to witness the death of something so praiseworthy and so needed - more today than ever. For 41 years this publishing house has been doing a fine job. The Pius XII statue at San Lorenzo to commemorate his going to the people amid the destruction of war. The Pope of Peace. May he pray for us from above. Peace to the world! 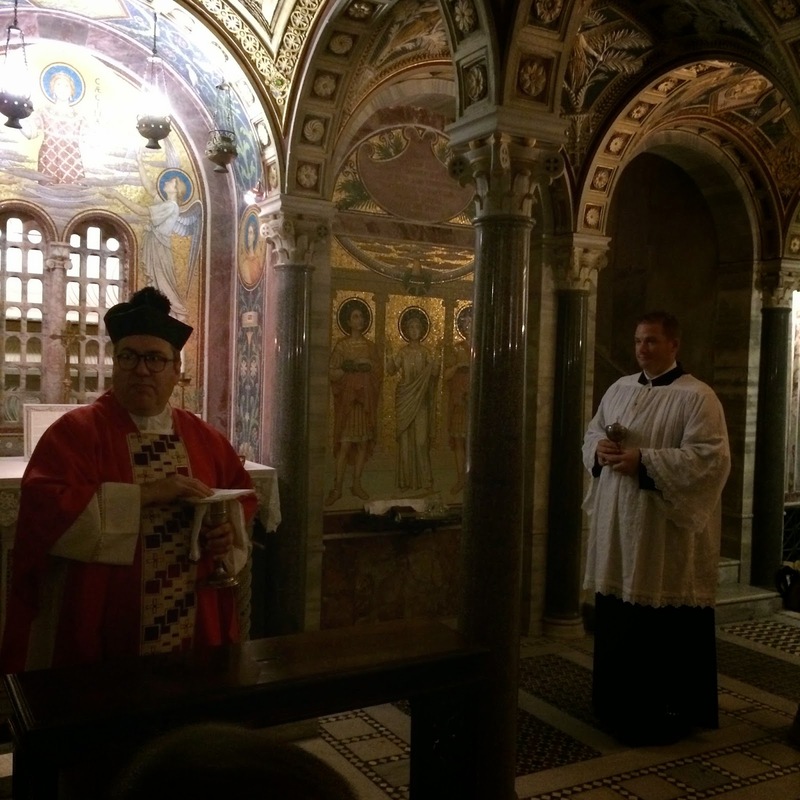 Holy Mass in the crypt at her tomb. Introit: "I will speak of Your decrees before kings without being ashamed. And I will delight in Your commands, which I love exceedingly." Thank you, Patrick, for the snapshot! "What then is Europe? It is a community of people who share a common spiritual tradition - a tradition which had its origins in the eastern Mediterranean and has been transmitted from age to age, and from people to people till it has overshadowed the world." In the final image you get the picture of how bad the damage was. A wartime travesty. Read the story here: http://www.catholicnewsagency.com/news/cardinal-remembers-pope-pius-xii-as-wartime-hero-saint/. Three years a priest, Providence had him on the spot in the San Lorenzo district the day fire rained from the sky at the Roma Termini rail lines. He was a first responder, seen here, in front of the Basilica of San Lorenzo. A prince among men, he was my favorite Italian prelate in Rome. Master of Pontifical Ceremonies from 1947 - 1954. Lived through two world wars. In recent years he could often be seen at S. Spirito in Sassia. 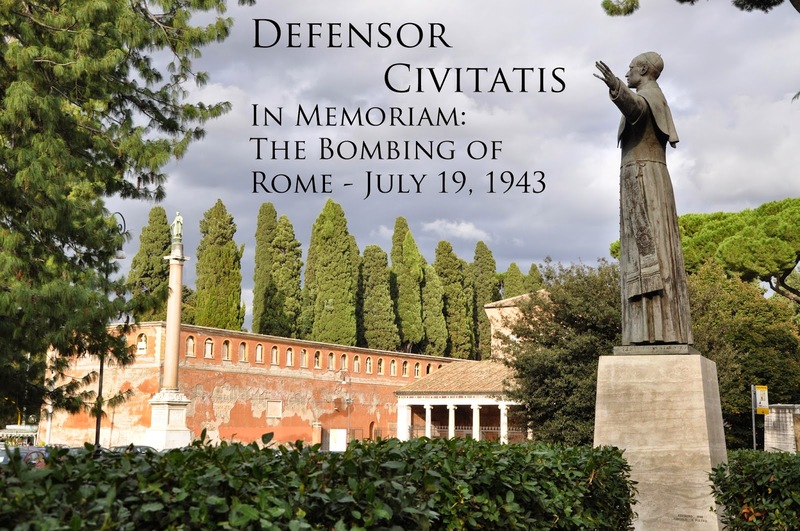 He was a first responder during the bombing of Rome in July 1943 and was there at San Lorenzo with two other priests: Pope Pacelli and Mons. Montini. I remember bumping into him once on the street and it was a true joy to chat with him. He always said: "Pius XII was my pope." Until the end he was well and receiving visitors - always seated in his Roman cassock. He accepted visits in the morning. Many thanks to the staff of sisters of the Holy Face who took care of him and managed his household. Just last month I stopped in to say hello and the porter said His Eminence was still going strong. Legends among us. The last Roman cardinal. Roman Basilica of St. Cecilia: Buona Festa! Today is the feast of St. Cecilia, November 22. St. Cecelia, a Roman by birth, was forced to marry Valerian, a pagan. She converted him and Tiburtius, his brother, to the Faith. She died in A.D. 230. Auguri to every girl named Cecilia! "O God, You gladden us with the annual feast of Blessed Cecilia, Your virgin martyr; grand that as we honor her in this service, so we may follow the example of her holy life." Join Us for an Unforgettable Trip of a Lifetime! Join Us in Italy: Spring 2015!